Great for Schools Churches, and Large Events! 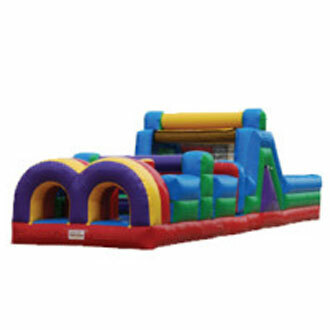 Description: Inflatable Obstacle Course bounce house inflatable for rent. This is an amazing unit, it's 40' long. Riders can race side by side through the obstacles and there is a climb and slide area in the middle before the reach the end. call us for more details, we also carry bounce houses, slides, and much more.